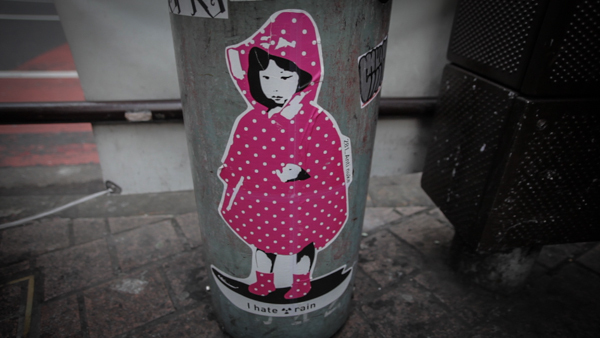 It was a few months after Japan’s March 11th 2011 earthquake, tsunami and the nuclear disaster that followed in Fukushima that I started noticing, photographing and videoing the stickers of a little girl in a raincoat with the legend “I hate ☢ rain” around Shibuya, Tokyo. That period a few months after the disaster, when all the lights that had been off or dimmed went back on and life in Tokyo seemed to return to normal, as if nothing had happened or was continuing to happen just a few hundred kilometres north, was a strange time. For me, the destroyed Fukushima Daiichi nuclear power plant seemed to be always lurking, just out beyond my peripheral vision. The daily ritual of checking every item I bought in the supermarket for its origin had become second nature, but it seemed as if the vast majority of the Japanese public had just hit the reset button and were carrying on exactly as they had before. The “I hate ☢ rain” stickers really caught my attention. I had no idea if they were being put up by a Japanese or a foreign street artist, but they intrigued me and gave me a sense that at least someone else out there continued to feel uneasy about the government and power company lies surrounding the clearly very serious situation in Fukushima. “Keep calm and carry on” just wasn’t working for me, and clearly not for whoever was putting up the stickers. I continued to film and photograph the stickers for about a year, and made some attempts to find out who the artist was to no avail. 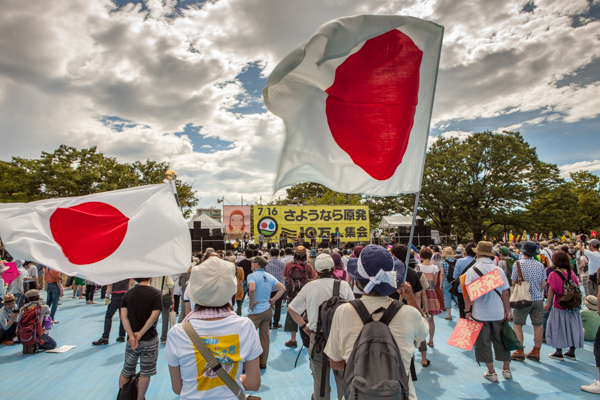 For the first anniversary of the March 11th disaster I put together a minute long piece, using footage of the stickers that I had shot in a bid to make a statement about the ongoing situation. Shortly after posting it on my website I received an email and some tweets from someone claiming to be “281_Anti nuke” the artist responsible for the work. He wanted to know if he could post the video on his website. I was more than happy for him to do so, it was his work after all. But on one condition: He allowed me to interview him for a documentary I wanted to make about him and his work. I had no idea whether I would be able to get funding to make the piece or sell it once it was finished, but this felt important. Often, some of the most rewarding filmmaking for me is personal work: Pieces I do just because I love the subject, with no time constraints and the freedom to create something I care about deeply. Street art and graffiti has been a passion of mine since I was a teenager. I may or may not have dabbled in street art myself, depending on who is asking. Although a little reticent at first, 281 agreed to let me make a film about him … then disappeared. His website went down and his Twitter feed disappeared. He basically vanished. The stickers were still appearing around Shibuya, constantly changing designs of the little girl and slowly some additional designs criticizing Tepco (Tokyo Electric Power Co.,­ the utility that operated the Daiichi plant). I knew he was still around, but how to contact him? By this point I had become a little obsessed with meeting whoever was doing this and finding out who they were and why they were doing it. I continued to search out and film his stickers using my 5DmkII with Magic lantern, which I always carried with me wherever I went. I had to wait a few months until suddenly one day the Twitter feed popped back up, and after a few direct messages, 281 agreed to meet me to discuss the documentary. I was a little surprised when he told me to contact his manager to arrange it, but went ahead. A week or two later, myself and my translator/producer Erina Suto were sitting across a table in a cafe from manager Ryan Roth and 281, a nervous looking guy in a black hooded top, dark glasses and a face mask. Many months would pass before I saw him dressed in any other way and even now I have only seen his face briefly on a few occassions. Understandably, given the illegal and inflammatory nature of what he was doing, he wanted to check me out as much as I did him. The meeting seemed to go well, and despite not being able to tell him what would ultimately happen with the film, he agreed to be interviewed and let me shoot footage of him on the street. Over the next couple of months, 281 and I met several times to go out stickering around Shibuya. I was worried that filming him while he was doing his thing might cause unnecessary attention — he was breaking the law after all. I kept my setup very minimal: a 5DmkII with Sigma 20mm 1.8 or Canon 50mm f1.4 on a monopod – manoeuvrable, unobtrusive and stable. Sometimes I used a cheap loupe I had bought on eBay to add extra stability, particularly with the 50mm. We also filmed an interview, I believe his first, at a secret location. To avoid any possibility of repercussions, legal or otherwise, the room was bland enough to be impossible to identify. It turned out that the reason his site and twitter feed had gone down was due to the online ultra rightists in Japan attempting to find out who he was and making some very unpleasant threats and comments about him. Keeping his identity secret was not just to protect him from arrest but also from a more immediate physical danger. The interview was shot on the 5DmkII with a Canon 24-70mm lens. I used 2 LED lights: One on him to give the hard shadowed look I wanted, and one on the background to give him some separation. I recorded the sound with an Audio Technica lav mic running into a Zoom H1. A more relaxed interview a few weeks later, in a different location, showed 281 using his laptop to illustrate how he designed the stickers. Further footage showed him cutting each individual sticker by hand. The second interview was again filmed with the 5DmkII, this time on a Wieldy Carbon fiber stabilizer to give some fluid movement to the shots, and also on a 60cm dry bearing slider to give it higher production values that complemented the street shots. The piece was edited in Adobe Premiere Pro Cs 5.5. Audio was synced manually from the Zoom. A lot of the sticker footage I had collected over more than a year was a little shaky, because much of it was shot on the fly, heading home after a few beverages. I knew new stickers wouldn’t last long, so I did the best I could with a handheld 5D. This footage was stabilized in post-production using the remarkable warp stabilizer in Adobe After Effects. Most music used in the film was sourced from musician friends in Tokyo with whom I have ongoing relationships. They supplied tracks in exchange for help with music videos or website assistance. The exception was the track used for the opening and closing sequences by a band from Kyoto called Frying Dutchman. I wanted something unique and powerful to compliment 281’s work. A few months before I had seen “Frying Dutchman” play at an anti nuclear march in Tokyo’s Yoyogi park and a friend had put me on to an epic 20 minute song of theirs called “Human error”. The song was perfect. I tried to contact them through their website, but got no reply. After a frustrating few weeks, I reached out to contacts in Kyoto and managed to get in touch with them. We met in Tokyo, and after a few drinks and them seeing a rough cut of the film, they agreed to sign a release for the music. Erina and I rushed to edit a version of the film to make film festival deadlines, and in the haste, produced something that we were unhappy with. It felt rushed and incomplete. Paid work took a lot of my time away, and I was forced to shelve the film for several months. During this period, 281 began to get significant foreign press attention. Articles appeared in The New Yorker, The Japan Times, on Giant Robot’s website and in other places. Significantly, several articles mentioned the documentary I had made and linked to the trailer. A lull in other work allowed me to return to work on the film. With the help of some respected friends, I put together a new edit that I was much happier with. Add in a little colour grading in Adobe Premiere Pro (mainly using fast colour corrector and the free Power Mask plugin), some Audio sparkle from Adobe Audition, and we arrived at what I considered to be the finished film. The question now was how to release it. It felt too important to just stick on Vimeo, I wanted a wider audience for it. I felt like 281 deserved it. It was then that I went back to VICE Japan, for whom I had previously made another documentary and who had previously turned down the 281 film. Upon seeing it, and having noticed the media attention, VICE said they were interested given a few provisos: They wanted interviews with his manager Ryan Roth; the writer of the New Yorker piece Roland Kelts; and a “graffiti” expert to round out and further legitimize the film. With the help of my friend Sean Bonner, I managed to secure an interview with the influential LA based graffiti artist Saber, who is perhaps most famous for the large piece he did on the bank of the Los Angeles river in 1997. The final work, measuring 250×55 feet (76×17 meters) has been called the largest graffiti painting ever. It was even visible from satellites. I needed to hire a cameraman in LA to film the Saber footage. After reaching out on Twitter, a retweet from my friend Dan Chung had secured someone to do it in 20 minutes! (Big thanks to Jon Putek, who also supplied some LA b-roll at no additional cost). A similar situation arose with the Ryan Roth’s interview in Hong Kong. A colleague, News Shooter contributor Jonas Schoenstein, happened to be in Hong Kong and was able to record the interview. 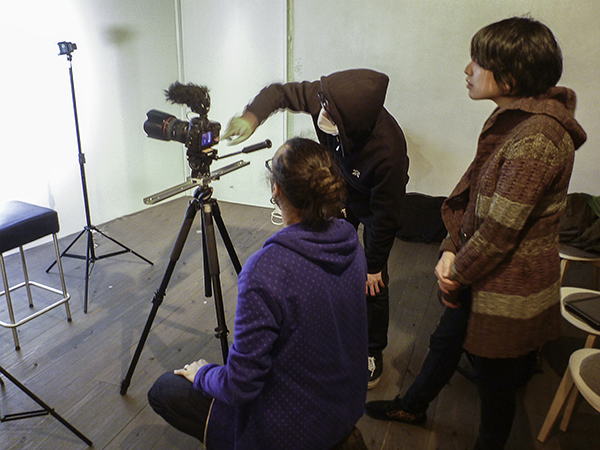 It was the first time for me to pay other shooters to help me finish a documentary. A quick interview with Roland Kelts in Tokyo filmed by me on my recently acquired Canon C100 (a dream camera after working with the 5D for so long), and all the footage was ready. I handed over my original edit of the film to VICE as an Adobe Premiere Pro file. All the additional footage was also given to the staff there, who wanted to do their own edit of the piece. I agreed to pass on the editing, but it was a difficult decision. I had spent so much time on the film and felt so close to it. Respect to Akira Kamitaki, who edited the final version you see here. Thanks also to Sebastian Stein (Vice Japan Production Manager) and Eiji Iwakawa (Vice Japan Post Production Supervisor) for their work on the film too. Thankfully, I was allowed a lot of input during the editing stages at VICE as the director. It was painful for my ego to see a producer and editor chop sections out of my film and reduce the length down to a VICE-friendly 15 or so minutes. I kept reminding myself that by handing the film over to them, I was ensuring a much wider audience. And was at least going to make some money for all the time and effort I had put in it. Akira retained a great deal of my original edit, adding extra footage and adapting the piece to suit VICE’s in-house style. The film is finally — 2 years later — seeing the light of day. 281 gains increasing exposure, more articles and short video slots are appearing about him, and this piece allows him to speak at greater length about his work and motivations. I want as many people as possible to see his work and think about what he has to say. To me, this shy, middle-aged Japanese guy has become something of a hero. I hope his work continues to make people in Japan question what their government and corporations are doing (or not doing) in their names.